HELEN KUTSHER AND her son Mark were recently honored by St. Francis University for their fundraising efforts on behalf of the late Maurice Stokes, a St. Francis alum and NBA Hall of Famer. 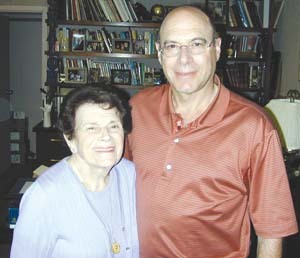 LORETTO, PA  June 7, 2005  Helen Kutsher and her son Mark Kutsher, owners of Kutshers Country Club, were recently honored with honorary Doctor of Humane Letters from St. Francis University in Pennsylvania. Helen and Mark were honored for the familys decades of fundraising efforts and donations to the Maurice Stokes fund. Money raised for the fund helped pay the medical bills of Stokes, an NBA Hall of Famer who graduated from St. Francis and was left paralyzed from an injury during an NBA game. The Kutshers hosted a charity basketball game for over 40 years at Kutshers Sports Academy that helped raise money for Stokes. After his death in 1970, the resort continued to host the event to help retired players who needed assistance. A few years ago the fundraising basketball event was transformed into the Maurice Stokes/Wilt Chamberlain golf tournament. The event raises money for needy retired NBA players. Stokes was one of the most talented players in the NBA until his career fell to a sudden end at the age of 24, when a fall during a game sent him into a coma. From then on, some of the greatest names in basketball would descend upon the Kutshers Sports Academy basketball court to raise money for Stokes. Wilt Chamberlain, Kareem Abdul-Jabbar, Oscar Robertson, Bob Cousy and many NBA players competed each summer to help him. Milton Kutsher, the late owner of the resort, began holding the game decades ago. The honorary letters Helen and Mark Kutsher received are the highest honor that St. Francis awards. It makes you feel good, Mark Kutsher said. He said the president of the university couldnt have been any nicer, to the entire Kutsher family. It was a special weekend for the whole family, Mark commented. Stokes was posthumously inducted into the NBA Hall of Fame in September 2004. In the memorable induction ceremony, Hall of Famer Jack Twyman singled out the Kutsher family for the help they gave to Stokes. Twyman was Stokes teammate on the Rochester and Cincinnati Royals and helped organize the annual charity game. Whatever we raised went out and helped people a long way, Mark Kutsher said. The Doctor of Humane Letters was her second in just as many years. Last year, Delhi University bestowed her with the same recognition upon her. Mark Kutsher noted that the hotel will host its annual charity golf game this August in the memory of Stokes and Chamberlain, who once was a bellhop at the hotel. It keeps the families going for those who are sick or need help, said Kutsher of how the charity tournament provides assistance to the retired players.